A wind farm in the Hesse state of Germany. Editor’s note: This is Part Four of a series on climate and energy issues in Germany and Poland that could help inform policy discussions in Ohio and other parts of the United States. Kathiann M. Kowalski’s recent research trip to Germany and Poland was made possible by a Transatlantic Media Fellowship from the Heinrich Böll Foundation. “This shift towards a higher share of renewables clearly means a transformation of our energy system,” said spokesperson Beate Baron at the Federal Ministry of Economics and Energy (BMWI) in Berlin. Those experiences in Germany could help inform choices by lawmakers, businesses and consumers in Ohio and elsewhere, as utilities face challenges from increasing competition, more stringent regulations and consequences of past business decisions. German policy leaders have talked about a transition away from fossil fuels and nuclear energy — an Energiewende — since the 1980s. First in some localities and then across the nation, feed-in tariffs set prices and gave preferential feed-in to the grid for different types of renewable energy. As the number of renewable providers grew substantially, demand and prices for electricity from coal and natural gas fell. Increases in energy efficiency further cut into profits for those parts of the energy sector. Meanwhile, Germany has also announced its intent to phase out electricity from nuclear plants by 2022. By 2015, renewable sources provided about 31 percent of Germany’s electricity, according to the Energy Information Administration. Starting next year, auctions will provide for more controlled growth and stability, greater cost control and increasing competition among providers as Germany adds still more renewable generation to its energy mix. The new system is expected to reduce costs, because companies will compete to provide utility-scale generation. Yet tariff costs had already fallen dramatically as newer renewable generation has come online, according to Agora Energiewende, an energy research group based in Berlin. In 2014 the group reported that electricity from new solar and wind facilities cost up to 50 percent less than that from new nuclear generation. The results have implications for utilities of all sizes, said Katharina Klein, who served as a policy expert at the German Association for Energy and Water Industries (BDEW) through August 2016. Although the association has about 1,800 members, four large utilities have historically provided 80 percent of the country’s generation. Those four companies saw their share of that market fall to less than half by 2011. Medium and small companies who rely heavily on fossil fuel energy have also felt squeezed. Despite clear statements from the government about climate change and plans to move away from fossil fuels, large utilities in Germany began building about two dozen new coal-fired power plants during the mid-2000s. By 2013, electricity companies in Germany were losing billions of dollars, leading some commentators to question whether the utilities were in a “death spiral.” The idea was that companies whose profits depended on sales volume of electricity from fossil fuels would earn less and less. Indeed, although the newest coal plants are more efficient, they have not produced whatever profits companies might have hoped for and are unlikely to do so in the foreseeable future, according to industry experts. “Now many of these investments are stranded,” said Jörg Jasper, a senior manager at EnBW in Berlin. One of the company’s most efficient coal plants was approved in 2008, and it now “runs quite a lot, but it doesn’t make very much money,” said Jasper. Now, however, the company is making headway in a new direction. “We adopted a decision to invest heavily in renewable energy a few years ago,” said Jasper. 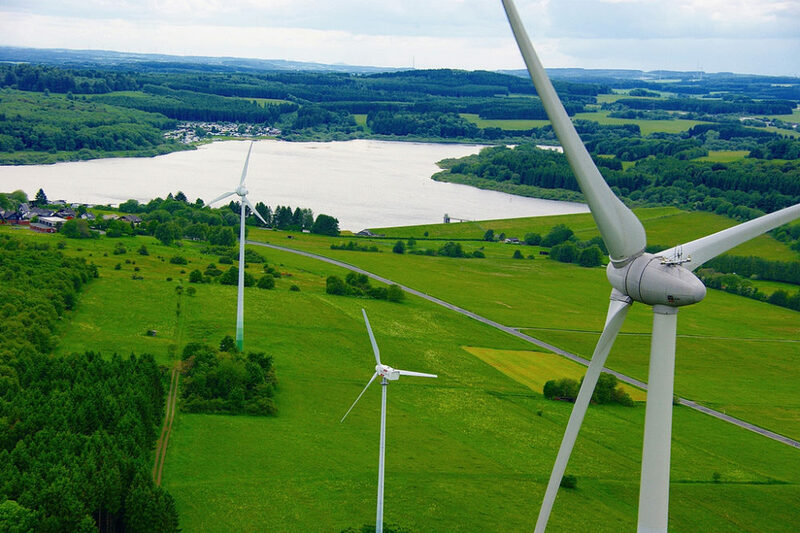 Now, though, EnBW has dramatically expanded its wind energy operations, including both land-based and offshore wind farms. The company is also focusing on grid services, electricity trading, and constructing and decommissioning different types of generation. With the country’s latest shift away from automatic feed-in tariffs for everyone to auctions for renewable energy, Jasper believes that EnBW’s size and expertise will put it in a good position to win those auctions and grow its share of Germany’s renewable energy market. “Then you have RWE and E.ON, which are both splitting up,” Klein said. Both companies took huge write-downs on their coal assets before the split. Earlier this year, E.ON’s shareholders approved a split of what was once Germany’s largest utility that spun off its fossil fuel-fired business into a new company, Uniper. E.ON kept a 47 percent minority interest, and trading in the remaining shares began last month. “Customer solutions such as energy storage, clean on-site generation, or energy management are now part of the three strategic businesses of the new E.ON,” said a company press statement issued last week. As for RWE, its renewable energy business is moving into a new company, while other types of generation will stay with the original company. Although the RWE and E.ON deals are structured differently, both would place management of renewables and grid solutions under independent management. Vattenfall took yet another direction. This summer the Swedish company sold its German coal-related assets to the Czech company Energeticky a Prumyslovy Holding AS and PFF Investments Ltd.
As nuclear and coal operations shut down, some jobs may be lost in those sectors. However, the end result need not be disruptive for Germany’s economy as a whole, said Baron. “While utilities will have to adopt to the new technologies and business models in order to stay in business, the Germany economy in total is forecasted (in long-tern projections) to benefit from the shift and the energy transition,” she said. Proponents of the German energy transition hope the country’s experience will benefit Ohio and other states, as well as the U.S. federal government, as they review renewable energy and energy efficiency policies. Nonetheless, opponents of renewable energy standards in the United States have claimed that policies supporting solar and wind energy inevitably lead to higher costs and economic disruption. For example, the conservative Manhattan Institute has claimed that Germany’s residential electric rates rose 78 percent from 2008 until 2012. “I wish as much media attention was paid to real facts and real-life experiences as to all the propaganda issued by the renewable energy promoters,” said Ohio State Senator Bill Seitz (R-Cincinnati) in an email after he had reviewed the report in March. Ministry spokesperson Baron took issue with the Manhattan Institute report and said the country remains committed to renewable energy. “The article mixes up figures and includes wrong statements,” including the assertion about Germany’s residential rates increasing by 78 percent, Baron said. German households still pay about 2 percent of their income for electricity, Barron added, noting that American households “pay roughly the same share of their income” because of the higher average household demand in the U.S. Meanwhile, Germany’s utility companies of all sizes must continue to adapt, according to Baron, Klein and other experts. The new auction system could well give an advantage to larger companies, who have more resources to develop bids and who can better absorb the loss of one bid if they win another project, suggested Matthias Deutsch at Agora Energiewende. The result could be more concentration in the industry, he noted. Lower reliance on coal for baseload power can also offer opportunities for grid balancing and other technology solutions that are part of the new strategies for E.ON and RWE, as well as EnBW. Also, Germany’s electricity sector is only one part of its overall energy market. In order to meet goals under the 2015 Paris climate agreement, the country must also reduce carbon emissions from heating and transportation, said experts at BMWI and Agora Energiewende. As those sectors shift to renewable energy, there might be additional opportunities in the electricity sector, Baron noted. In any case, Klein said, the four large companies are all “in a transformation phase,” and many of BDEW’s 1,800-plus member companies are still charting their own new directions. “Economically they know it’s not the old business case that they used to make money on,” Klein said. Similar to Cleveland, Poland’s capital city of Warsaw is making efforts to fight climate change despite the national government’s overall commitment to coal for the nation’s energy future. A new law that took effect in Poland earlier this month could kill growing competition from land-based wind farms by expanding setback requirements tenfold and increasing tax burdens, clean energy advocates say. As it is in Ohio and elsewhere in the United States, the coal industry in Poland is declining amid economic and environmental pressures. And the industry’s political and cultural importance is prompting state action to save it.